Physical Therapist jobs are on the rise, projecting to grow 25% between 2016 to 2026. In 2016, the number of Physical Therapist jobs totaled 239,000. With an average of 9,000+ new Physical Therapists graduating from PT programs across the country each year, the Physical Therapist job market becomes a little more competitive each year. I won’t bore you with too much math, but if there’s not at least a 2% rate of PTs retiring each year, that 25% growth rate won’t match the inflow of new PT grads! In other words, at the rate new grad Physical Therapists are being produced, it will take at least 2% of the PT workforce to retire in order to prevent oversaturation. You can read this article for my opinion of the job outlook for Physical Therapists. The bottom line: we’re getting more new grads and seeing fewer retirees. 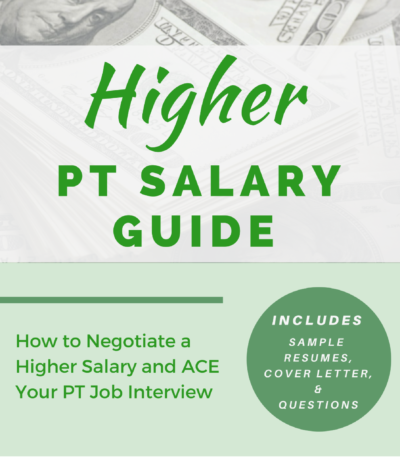 The PT Job market is being saturated with low cost new grads. For a Physical Therapist with 5, 10, or even 20+ years of experience, this is a challenge. 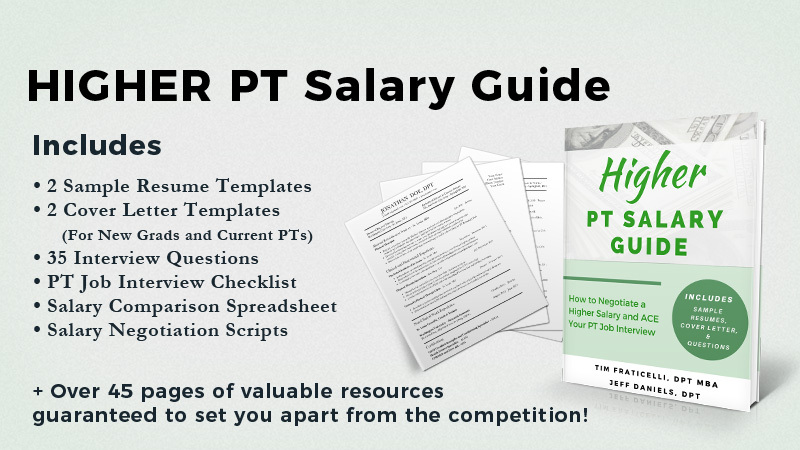 Let’s face it, a new PT grad is usually thrilled to start their career at $64,000 at an outpatient PT clinic and employers are thrilled to pay them this rate! Talk to a PT with even just 5 or 10 years of experience, and the story changes. If you are changing PT jobs or getting back into Physical Therapy, you will need to set yourself apart as much as possible! Even the new grad PT will face more competition as PT schools continue to pump out students. There are plenty of ways to stand out from the crowd in your Physical Therapy career: become specialized, obtain certifications and new skills, branch out into management. BUT, all of that hinges on one thing: Can you sell yourself during an interview? Whether you’re a new grad, a PT looking to change jobs, or a PT trying to get back into the job market, you share one thing in common: you will all have to interview. If you’re like most applicants, the idea of interviewing makes you feel like you could just curl up in a corner and shiver with a cold sweat. Ok, that’s a little dramatic, but it can still feel intimidating, right? You may be interviewing at a new clinic or maybe you’re trying to move up into a management position. Of course you’re going to feel nervous! Take a step back and realize this: everyone’s a little nervous and it’s ok that you’re feeling nervous. The key is NOT that you should avoid being nervous. The key is to make it look like you have confidence despite feeling nervous. If you are good at mustering up confidence, that’s GREAT! Know your resume in and out and get ready to explain anything on it in more detail. One of the strategies I share with PTs looking improve their interview skills is to organize your accomplishments on notecards ahead of time. As you practice the sample interview questions listed below, look at your notecards to find trends in your examples. The ability to answer any question with confidence hinges on your ability to recall an example or story. You’ll start to notice that you can answer multiple questions by thinking back to a story. This is important because instead of trying to memorize answers to specific questions, you are able to craft an answer that satisfies multiple variations of questions you may hear during an interview. By organizing your accomplishments into notecards or story cards, you’ll start with the right mental framework to produce an answer that has structure to it. The point of the interview is to learn more about you. The good news is that you’re an expert on that subject! The interviewers don’t want to hear canned answers that could describe anyone. They want to hear stories that make you unique. You already have your story cards made, so now focus on the delivery. When you present your story to answer their questions, deliver it with a positive attitude. In other words, avoid being a “negative Nancy”. No one likes a ‘woe is me’ story, so by pulling out the positive side of things when you deliver your answer will keep the energy in the room up. If you’re like most people, you are more likely to read your notes and story cards and prefer to practice interview questions by thinking them through. There’s nothing wrong with this approach initially, but you need to seriously practice what you’re saying out loud. At first, it will feel like you’re stumbling through your answer. That’s normal. But when it happens, think about the item that you’re getting hung up on. Now make a small outline of what you’re trying to say. Go ahead and try to answer this question out loud right now. I’ll wait. Seriously, go ahead. How’d it go? Did you fumble around a little? Feel like you didn’t have the structure you needed. Did you ramble on, unable to find a good stopping point? Consider this: They’re not looking for your entire life story here. Keep it to the point. *This hurts my ears and my heart. Please don’t ever do this. Wrap it up and don’t ramble! Give them an opportunity to ask you about your interests. Here’s my answer to the question. You get the picture. It doesn’t need to be a cookie cutter 4 part answer, but it doesn’t need to take more than 60 seconds to get out either! Keep it brief and give the interviewer a chance to ask about the new facts they’ve learned about you. One of the best videos I’ve seen about creating confidence comes from Amy Cuddy, a social psychologist who presented a 21-minute video on body language. She explains how our body language affects now only how people perceive us, but also how we perceive ourselves. In other words, the way we stand and present our body language can actually manufacture the confidence we desperately need. In her TED talk, she delivers a concept of Power Posing to increase confidence. The idea is this: by standing in a power pose, your body increases testosterone by 20% and decreases cortisol levels by 25%. So, give it a try – what do you have to lose? “But where can I do this without looking like a fool?” Fair question. If you’re going to do the ‘superhero’ pose (my recommendation), use a quick bathroom break and find a stall to stand tall. Seriously. 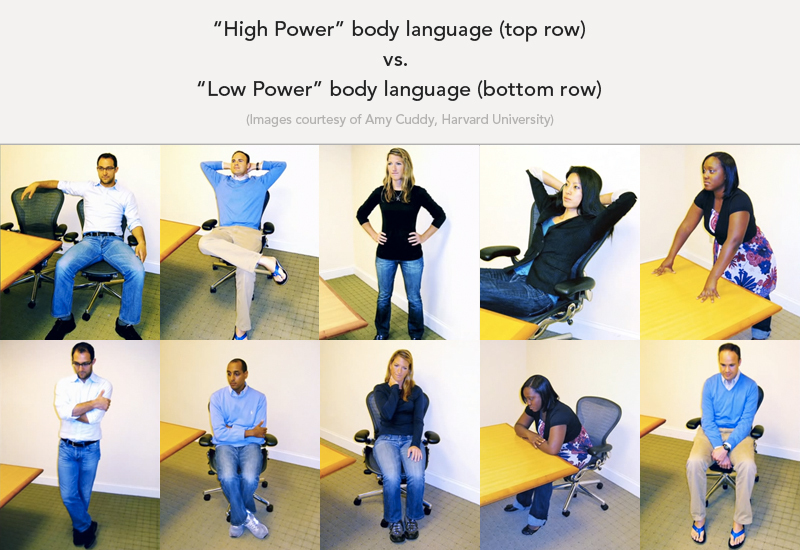 But just as important as trying to power pose before the interview, you should try to avoid the low power poses during your interview. Here’s an image showing the difference between the two. Think of your interview as a conversation. How awkward would a conversation be if you didn’t ask any questions? Sure, the hiring manager is going to take the lead with the standard interview questions, but that doesn’t mean you can’t interject with relevant questions during the interview. I’ll assume you’ve done your research on the company (please, for the love of all things good in PT, spend at least an hour researching the company before your interview). Did anything stand out during your research? Does their website say anything about specialty training or mentor opportunities? What about their marketing efforts and social media presence? Bring up these questions as the conversation develops. Don’t just save them for the end! Knowing questions to ask in an interview is so important, I wrote an entire article on it! 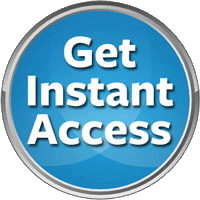 + over 45 pages of valuable resources guaranteed to set you apart from the competition. Tell me about your experiences in Physical Therapy (internship or full time work). What did you like best about the previous clinics? What did you like least about the previous clinics? What would your previous supervisor say is your greatest strength? How do you deal with stressful or unexpected situations? Describe a time when you “blew it” and how you recovered from it. What is your favorite condition or body part to evaluate and treat? What are you professional goals for the next 5 years?